Photo Courtesy of Canadian Timberframes Ltd. Choice is good. Just about everyone will agree on that. But when embarking on a project as complex as designing a custom timber home, it’s easy to feel overwhelmed by the number of options and decisions that need to be made. To keep your sanity and stay the course, take it one step at a time, starting with these 11 tips to creating a floor plan that will satisfy you now and in the future. 1. Start with your site. Before you can determine how your floor plan will function and flow, you’ll need to evaluate your property, capitalize on its strong points and pinpoint any obstacles. Look at the features that will both support and constrain the way you want to organize the house. If you have an amazing view of a lake or snow-capped mountains, orient the plan to take advantage of those landscapes. If your views are blocked by a thick forest, arrange your spaces inward and create good line of sight from room to room. 2. Decide how you want your home to feel. There are a number of clues that tell you, at a glance, if a home is formal or casual: an open great room or a compartmentalized living room; a dedicated dining room or an eating area off the kitchen. But there are subtle differences, too. For example, in an effort to create separation, a formal space incorporates many more hallways than one that’s informal. A delineated foyer establishes a more ceremonious entry than a doorway that leads right into the great room. These types of elements will set the tone for your entire home. Imagine yourself living in each room of your house. How will it look and feel? What will you see in front, behind, above and below? What sounds will you hear? To clearly convey that picture in your mind’s eye, give your designer a notebook of clippings (or images saved to your computer or tablet) of homes and features that speak to you, so he’ll have an idea of what you want your home to look like and an indication of the quality you expect. Consider your family makeup (adults only, adults and kids, aging parents), how you live (formal or casual, hectic or relaxed) and whether you like to entertain or have hobbies that require dedicated areas. Bigger isn’t always better, but it does always cost more. Before you waste space on square footage you really don’t need, make sure the number, type and size of rooms reflect what will take place in them. Think of your rooms in terms of activities: Instead of “kitchen” and “living room,” think “cooking” and “family time.” The current trend in custom housing is to reduce square footage by as much as 30 percent and reallocate the money into higher-quality materials. 6. Map out a plan. Identify access points for vehicles and pedestrians, then within those boundaries, determine the shape of the house and direction it will face. Use your list of activities to position rooms. Start by breaking down your list into private and communal activities and identifying where each one should take place. Then use bubbles to represent rooms and group them according to where you’d prefer they be positioned. Finally, square off the bubbles to create a rough floor plan, adding enough space for walls. Architectural components are integral to your home, but they can hog space and cost money, so don’t forget to figure them into your budget. Some popular elements: large windows with window seats, massive trusses, dormers and hipped or gabled roofs. If you’re like most people, a large, open great room is a given in your timber home. But it’s what you do with that vast space that determines how comfortable it will be for you and your family. The secret is to create visual cues that let your mind reconcile how each space will be used. Varying ceiling heights, bump outs or staggering floor heights are a few ways to delineate spaces without walls. If you can’t afford everything you want, make cuts that work for your lifestyle, whether it’s shaving off square footage or minimizing special features. But be careful about sacrificing quality — particularly when it comes to your building envelope. Never skimp on things like windows, doors, roofing materials or insulation. These elements will affect your long-term satisfaction with your home and potentially cost you much more money down the line in terms of energy bills. 10. Customize a stock plan. 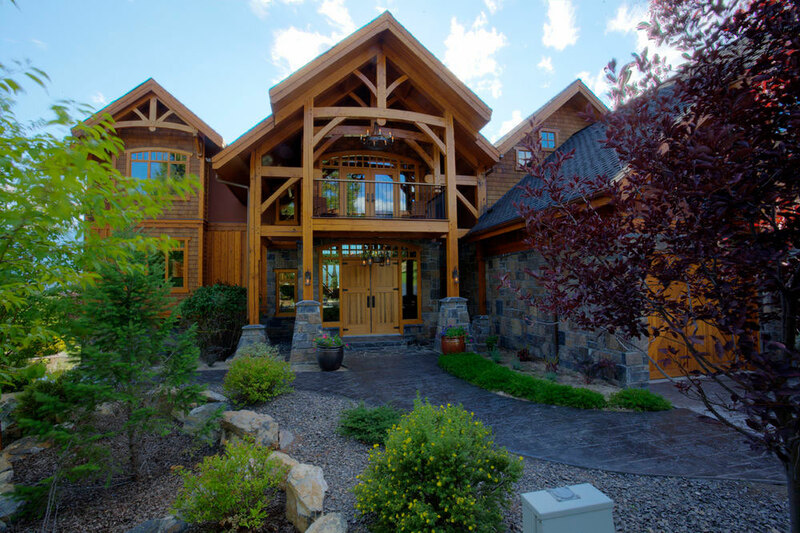 When you start looking at timber home providers, you’ll find that most of them offer catalogs of dozens, if not hundreds, of plans. Instead of starting from scratch, peruse these plans, then tweak to fit your lifestyle and home site. This is a great way to save time and money. Professional advice is crucial throughout the entire home-building process, but this is your home, so make sure you discuss every suggestion thoroughly. And don’t be afraid to get a second opinion if you have concerns. You’ll want to work with someone who’s as excited about creating your dream home as you are.